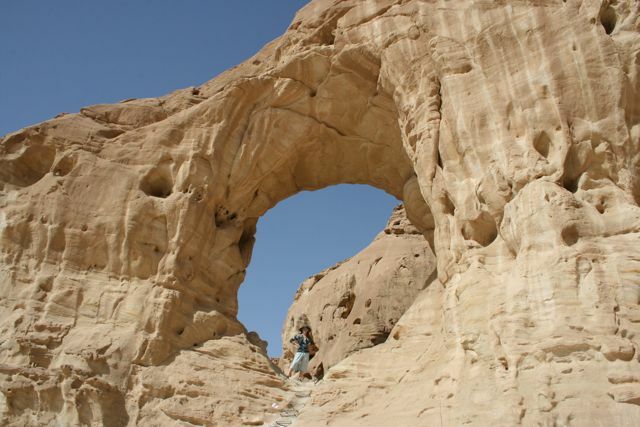 On our way out of Eilat today we made a stop at Timna National Park. Kendall found us a trail marked “easy” on the map that started with a steep climb up to ladder rungs embedded in sandstone. Up we climbed through a natural arch, dropping into a slot canyon on the other side. 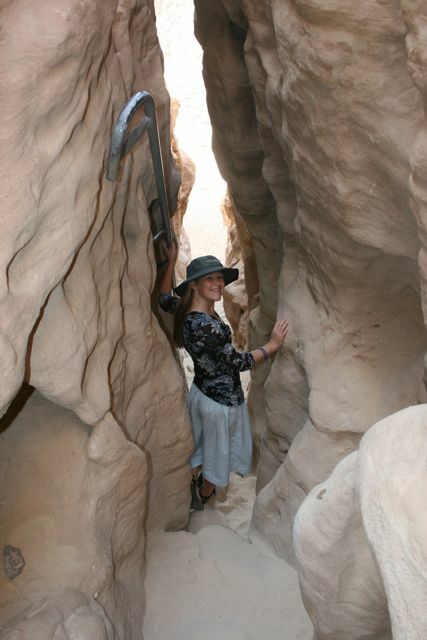 There were several downclimbs in the slot canyon, to where the trail entered an old mine. Climbing into the mine we found more ladder rungs climbing up the mine shaft and topping out we started traversing the knife’s edge of the cliff. Needless to say this trail was incredible and it was an “easy” trail. Later I read that the difficult trails are 12+ hours and serious undertakings; I can only imagine, but would like to come back and try them during the winter months. Our trail took us by more copper mines that we could explore and see the copper in the walls. 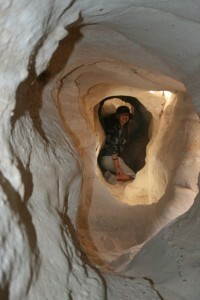 Last year it was discovered that these were King Solomon’s mines! After our hike we got in the car and drove to Solomon’s Pillars, large rock formations that look like gigantic pillars. It was here God answered one of our prayers! Kendall’s camera went missing two days ago and we thought it had fallen out of the car near the Dead Sea. We prayed and have been waiting on God to answer (He always answers!). At Solomon’s Pillars I looked back at the car and the camera was sitting in between the windshield and the hood of the car! God is so amazing and we got His answer on video, such a cool experience to walk your kids through God visibly answering prayer and waiting patiently on the Lord. God answered our prayer and then took us straight to a replica of his tabernacle! It was the best presentation of the tabernacle I have ever experienced. They have evidence the wanderers in Numbers, being led by Moses, came to this area and named the springs of water found here. There is so much rich biblical history to learn. Every piece of the tabernacle had meaning and all of it points to Jesus and what he did on the cross for us all. That experience was worth the trip to Israel. From Timna we headed north again and are now outside of Dimonya, in Camel Land (a working camel ranch since 1986). This is another kid friendly paradise. You are met with tea (from the desert) and asked to sit down and relax (a refreshing break to driving). We are going to take a camel ride in a bit on the original spice route. Then sit down for a shepherd’s meal. 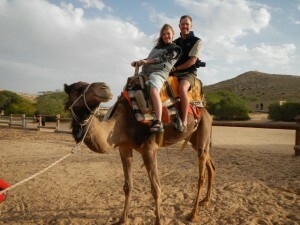 The camel ride turned out to be a lot of fun. 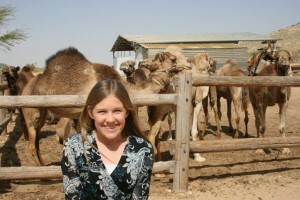 Kendall and I rode together while our guide told us all about camels. The setting was beautiful as we rode along the canyon with an old city perched on the side of it. The shepherds meal turned out to be fabulous, also made out of the things the shepherds would have with them in the fields (potatoes, fire made bread, lentils, rice, raw vegetables, with dates for dessert). I met Ron and had great conversation with him on the rich history of Israel. Kendall talked with his nine year old daughter, Gia, and had lots of fun trying to get over the language barrier. Everyone is friendly and helpful, showing once again the beauty of the Israeli people. This day has been one of the very best I’ve had in all of Israel. I woke up at 6:00 in the morning. Daddy was still asleep and I didn’t want to wake him, so to keep myself awake and out of mischief, I got in the shower. When I finished, I walked into the bedroom on tiptoe to find daddy up and looking at the computer. He told me that he woke up while I was in the shower and looked at the oven clock to see 2:00am. 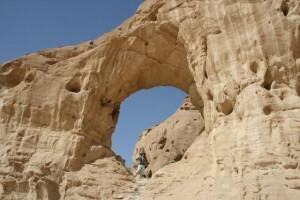 He said he thought I must be very excited to go to Timna Park; so excited in fact, that I got up at 2am! He said, “Then I remembered what I told you to do (The clock was wrong, so he told me to add four to what ever time it was – for example if it was 3:00, add 4 and you get 7:00.) I thought that was a very funny part of our day! Then daddy took a shower while I read my letter for the day which happened to be Mrs Emily Johnsons. It was such an encouraging good letter, that it was added to the list of cool, awesome, good, thoughtful, and fun things of the day (our schedule has changed a little bit, so it’s ok you thought we were going to Masada/Dead Sea today Mrs Emily. 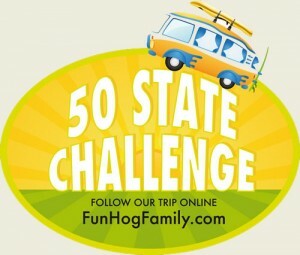 We will be going there tomorrow. But your letter still blessed me a very very lot). Next, daddy confronted me with the option of walking on the beach again or going straight to Timna Park. (I think God has been inspiring me to answer with the best decision lately because, whatever I decide, turns out for the best. It’s so cool to see God move.) I decided to go straight to Timna Park, and so we did. We got there at a good time, got our map of where everything was (surprisingly enough, Timna isn’t a National Park.) and headed off to explore Timna. (Whenever I hear the word Timna, it reminds me of Uncle Tim. Daddy and I think its because they are both fun!) We saw “Spiral hill” – (a hill called “spiral hill” because there is a spiral going up to the top of it.) “The Stone Mushroom – (a rock that looks like a mushroom that God created). The cooper mines, and other cool spots. 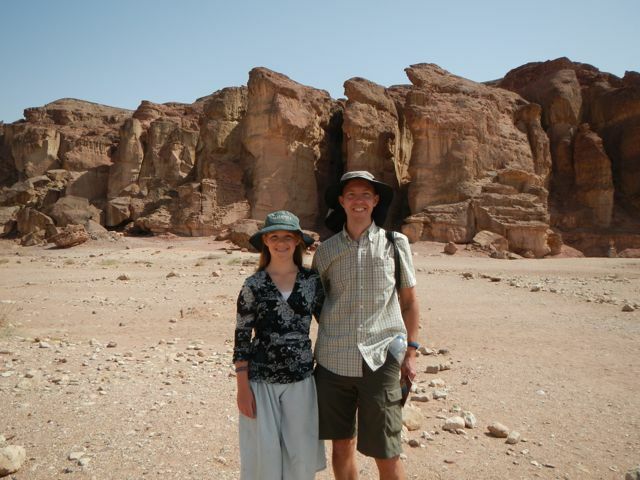 Here is how we spent our time at Timna. We drove past “spiral hill” on our way to the stone mushroom. Then we walked up to the stone mushroom, and took pictures. Next, we did a special hike. The hike was entitled as easy, an hour long, and it went through some cool arches and into the mines (some spots you even had to crawl through!) We parked the car and followed the red trail marker. I was in the lead as Daddy was videoing the trail. We clambered up and over tight spaces, jumped off and over rocks, and I felt myself rockclimbing up a ladder up to one of the arches in the rock. Timna reminds me of Colorado and the Grand Canyon. Well, when I scrambled to the top, I couldn’t repress my shouts of glee, happiness, and surprise. There below me the trail turned into a canyon without water!!! A ladder went down into it and it tunneled out onto a fun unknown adventure. I flew down the ladder, ran through the canyon, and headed out into the unknown! Next we hiked into a copper mine that Egyptians dug. We crawled in, up and over and out and back down through a canyon. We continued through a trail I just can’t capture with the pen. It was one of the most coolest hikes I have done. As for being easy, it was like Salome without any water but much more cool as the tunnels for copper were dug by Egyptians from biblical times!!! It is so cool to see history come to life! Especially so if that history is biblical!!! 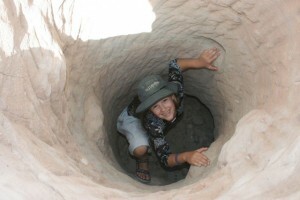 Daddy let me go cave, explore, wander, think and enjoy and experience as much as I was able. It was so so so much of a daddy daughter thing. I can’t tell you all about it. You have to experience it yourself to really know its true worth. When we finished the hike, we got in the car and drove to Solomon’s Pillars. Now, because we lost the orange camera (we believe at Lot’s wife) we were going to go check there after we finished Timna before we went to our next stop. Well, as we got out of the car and were about to head up to Solomon’s Pillars (go explore them). God turned daddy’s eyes to rest on the windshield. He looked at me and said, “Our God is an awesome God. King of the Universe. He answers prayer. And to show you how he does Kendall, look at the windshield. I wonderingly looked to there behold, half hidden under the windshield, the two days in the very heart of a very busy town called Eilat, the lost orange camera. It was such a surprise, but I sure am glad to have found it! Our God is an awesome, incredible only God. He works in more ways than one. The next God thing was our tour guide. Timna Park built a life-size tabernacle. Well, Ms. Allison took us on a tour of it explaining every little detail. She was a very firm Christian, loving Jesus with her whole heart and letting her little light shine deep in the desert as it was. I can not describe how she did it, it was so awesome, cool, amazing, terrific! We left that awesome park (which if you ever visit Israel, you have to see Timna!) and hurried down the road to our camel place. 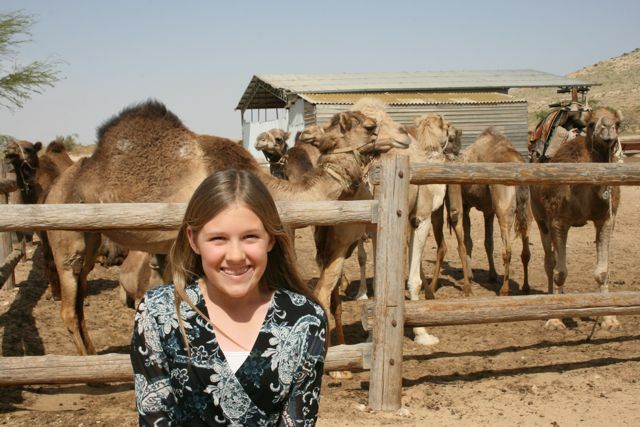 We are staying at a camel ranch tonight. 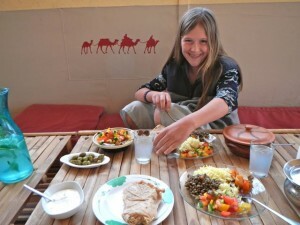 We had some tea, relaxed, road a camel for an hour around in the desert. If you think it was burning hot, it was not. I shiver even now at the thought of that freezing, chilly, cutting to the bone ride. The camel was very cool! Yes, but the air was freezing! We went to bed soon after a good dinner. Good night! Love, love, love the tabernacle!! Going to watch that again and again. And the canyons and camels looked like a fun adventure too. I was just reading about Jesus being our high priest in the order of Melchizedek. So cool to see the priestly garments and hear about Jesus carrying us like the priest carried the nation on his shoulders. Timna and the tabernacle have been one of the trip highlights for sure! We just need the whole family to experience them together now! I have thoroughly enjoyed reading about all your adventures and appreciate the ways you have shown God at work in even small requests–yet amazing answers. Thank you, God, for blessing our children so mightily. Actually, the camera was a BIG answer! The Ibex was another BIG answer! Love you!